Description: Thallus erect to 30 cms polysiphonous with 9-10 periaxial cells. Branched irregularly in one plane irregularly alternate. Ultimate ramuli monosiphonous and formed in "pincer-like" pairs. 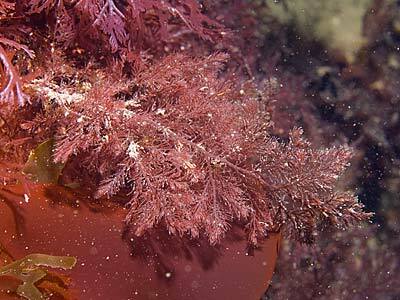 Habitat: Epilithic in low littoral rock pools and sublittoral to 33 m.
Distribution: Widely distributed around the British Isles including the Shetlands and the Channel Islands. Europe: Portugal, Spain, France, the Baltic and Norway. Ultimate ramuli monosiphonous and formed in "pincer-like" pairs. Morton, O. & Picton, B.E. (2016). Heterosiphonia plumosa (Ellis) Batters. [In] Encyclopedia of Marine Life of Britain and Ireland.